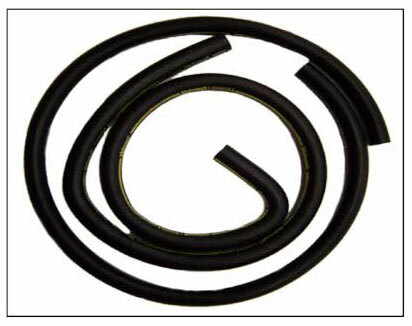 This Mustang Heater Hose is perfect for everything from the every day driver to the trailer concours show Mustang. Two 4 foot long pieces of heater hose, enough to complete your Mustang. These hoses feature a 90 degree bend like the original for a correct layout in your 1973 Mustang's engine compartment with factory Air Conditioning. This set has a continuous yellow stripe broken up by the Motorcraft trademark. The hoses are not striped to look perfect, they are striped to look authentic. Do not clean hoses with Armor-All or other products that contain solvent. We recommend cleaning by using a very dilute soapy water solution on a damp cloth with very light pressure.